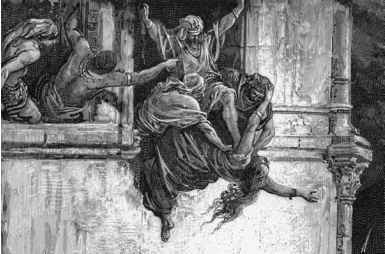 Another event which occurred at the time of Jezebel was when the prophet Elijah challenged the 450 prophets of Baal whom she had appointed. Elijah told the people "If the Lord is God follow him; but if Baal is God, follow him." And to show the people that the Lord was God he challenged the prophets of Baal to call upon Baal to reign down fire from heaven, but nothing happened when they prayed to Baal. Then Elijah prayed to God that the people would turn their hearts back to the Lord. God heard Elijah's prayer and fire from the Lord fell from heaven and burned up the sacrifice that was prepared by Elijah. When the people saw what happened, they fell face done and cried "The Lord-He is God! The Lord-He is God!" 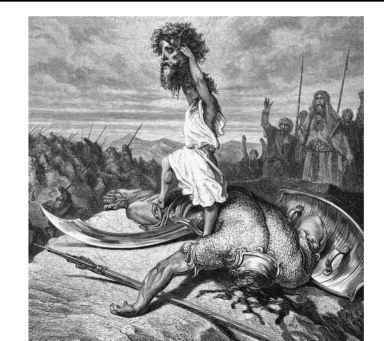 Elijah then commanded the people to execute the prophets of Baal. Jezebel then threatened to kill Elijah, and Elijah fled from Jezebel into the wilderness. 1Kings 19:9-15 then states the following: "And there he went into a cave, and spent the night in that place; and behold, the word of the LORD came to him, and He said to him, "What are you doing here, Elijah?" So he said, "I have been very zealous for the LORD God of hosts; for the children of Israel have forsaken Your covenant, torn down Your altars, and killed Your prophets with the sword. I alone am left; and they seek to take my life." Then He said, "Go out, and stand on the mountain before the LORD." And behold, the LORD passed by, and a great and strong wind tore into the mountains and broke the rocks in pieces before the LORD, but the LORD was not in the wind; and after the wind an earthquake, but the LORD was not in the earthquake; and after the earthquake a fire, but the LORD was not in the fire; and after the fire a still small voice. So it was, when Elijah heard it, that he wrapped his face in his mantle and went out and stood in the entrance of the cave. Suddenly a voice came to him, and said, "What are you doing here, Elijah?" Then the LORD said to him: "Go, return on your way to the Wilderness of Damascus; and when you arrive, anoint Hazael as king over Syria." This same King Hazael is mentioned in Assyrian records. An inscription, by the Assyrian king Shalmaneser, known as the Black Obelisk states this: "I fought against Ben-hadad and take credit for his downfall. Hazael, the son of a worthless man, then ascended to the throne." "Now when Jehu had come to Jezreel, Jezebel heard of it; and she put paint on her eyes and adorned her head, and looked through a window. Then, as Jehu entered at the gate, she said, "Is it peace, Zimri, murderer of your master?" And he looked up at the window, and said, "Who is on my side? Who?" So two or three eunuchs looked out at him. Then he said, "Throw her down." So they threw her down, and some of her blood spattered on the wall and on the horses; and he trampled her underfoot. "And Elijah came to all the people, and said, "How long will you falter between two opinions? If the LORD is God, follow Him"
"Hear me, O LORD, hear me, that this people may know that You are the LORD God, and that You have turned their hearts back to You again." "Confess your trespasses to one another, and pray for one another, that you may be healed. The effective, fervent prayer of a righteous man avails much. Brethren, if anyone among you wanders from the truth, and someone turns him back, let him know that he who turns a sinner from the error of his way will save a soul from death and cover a multitude of sins."